The furthest galaxy ever observed is so far away that the starlight we now detect was emitted less than 500m years after the Big Bang. It has taken about 13 billion years to reach us. But there’s a lot of things about a galaxy that we can’t see. For example, we think galaxies are immersed within gigantic “halos” of an invisible substance dubbed dark matter. Scientists don’t actually know what dark matter is, but they know it exists because it has a gravitational pull on surrounding matter. Now our new research, published in Nature Astronomy, presents a way in which we could learn just how galaxies have evolved within this strange, dark matter across most of cosmic time. That we can see light emitted 13 billion years ago may sound amazing. But we can actually see light emitted even earlier – before galaxies formed. For a few hundred millennia after its formation, the universe was a hot mess of light particles (photons), electrically charged protons and electrons (plasma), as well as dark matter. The photons were trapped among the plasma: continuously “scattered” in random directions by near-constant interactions with the free electrons. Like trying to traverse a crowded, bustling room, the average path length of each photon was very short before its next interaction. This made the universe opaque – if you were trying to look through this medium it would be like looking into a bank of fog. But 380,000 years after the Big Bang, the universe had expanded and cooled to a point when the free electrons could bind with the protons to form atoms of hydrogen. The scattering quickly ceased, allowing the photons to stream freely across the universe with no free electrons in the way. As this transition happened everywhere in the universe quite quickly, from our point of view it’s as if all these photons were suddenly released from the inside of a huge shell containing the opaque soup of particles and dark matter. Effectively, this “shell” is the furthest “object” that we can see, at a distance of 45 billion light years. Scientists call it the surface of last scattering. Travelling through the cosmos, these photons lose energy as the universe continues to expand, stretching their wavelengths. And we can detect them in the cosmic microwave background, or CMB, which is the radiation left over from the birth of the universe. We’ve studied the CMB for decades now: a lot of information about the properties of the early universe are encoded in its light. But recently it has been possible to extract even more information from it by exploiting the fact that every photon in this radiation has had to travel through a universe that is filled with matter. Einstein’s theory of general relativity describes gravity as a distortion of space-time due to the presence of an object with mass. This distortion can deflect the paths of photons that pass by the object – a phenomenon known as gravitational lensing. So by looking at how light from some background source (like a galaxy) is deflected due to an object in front of it, we can work out properties of that foreground object. The surface of last scattering acts as a cosmic background light, shining through all the matter in the universe. As a result, the photons of the CMB are gravitationally lensed by the intervening matter between the surface and us. Our view of the CMB is like our view of a distant landscape seen through a window pane riddled with subtle imperfections. Remarkably, we can now map these imperfections across the sky, providing us with a means of “seeing” the gravitational imprint of all of the mass in the observable universe. This is giving us a new way of studying galaxies. For example, we can measure the amount of CMB lensing in different directions and weigh cosmic structures simply by looking at how much they have deflected the CMB light. This is what we have just done for the most massive objects in the universe: clusters of galaxies. Clusters of galaxies don’t just contain galaxies: the space between the galaxies is filled with a hot plasma, and the galaxies and gas are immersed in dark matter. Add it all up and the total mass exceeds one hundred thousand billion suns, creating great valleys in space-time. Scientists have long been looking for a reliable method to translate the number of galaxies in clusters into the total mass of dark matter, gas and stars. We can use new lensing maps of the CMB for just this purpose. The lensing maps are constructed by examining maps of the temperature fluctuations of the CMB. In regions where CMB photons have been strongly deflected, a subtle signature is imprinted in the temperature distribution. Carefully filtering the temperature map reveals the pattern of lensing across the sky. By measuring the average deflection of CMB photons around clusters, we have shown how the amount of deflection – and therefore total mass present, including dark matter – depends on the number of galaxies in the cluster. In effect, we’re seeing the imprint in space-time of the massive dark matter halos. 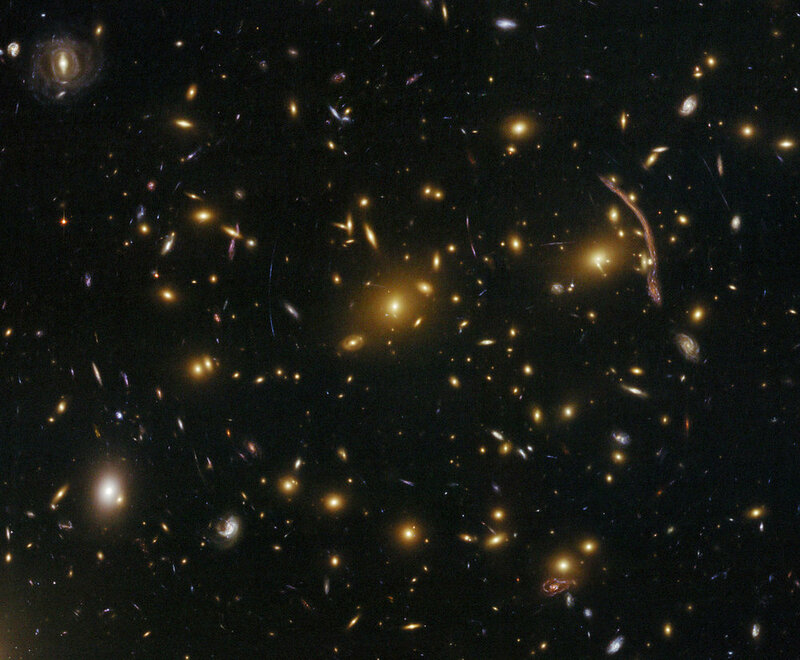 Using gravitational lensing to reveal the distortions in space-time around galaxies and clusters, and therefore learn something about their mass distribution, is not new. But most previous studies involve the lensing of the light coming from other background galaxies, rather than the CMB. Using the CMB as the light source offers tremendous advantages. As the surface of last scattering illuminates all objects in front of it, we can examine the relationship between luminous galaxies and the dark matter structures they inhabit further back into cosmic history than has so far been possible. Not only have dark matter structures been constantly evolving through gravity, we know that the properties of galaxies – such as their mass and star formation rates – are strongly dependent on their large-scale environment. We still don’t fully understand that link, but CMB lensing might ultimately help us crack how it happens.